The Global Locomotive design for the CLEAR container range is based around the Cummins family of rail engines with the manufacture and supply of product from 700HP to 4,200HP. Cummins rail engines are mostly US EPA Tier 3 approved and Cummins have over 13,000 rail engines in daily operation worldwide with more than 5,200 service locations in 160 countries. 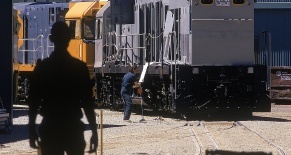 Global Locomotive is no longer connected with the workshop located in Tenino WA, USA. Please contact Global Locomotive on workshops@globallocomotive.com for further information and alternative arrangements.